What FreeRTOS stores in its TCB (Task Control Block, the descriptor of the task) is the pxTopOfStack (current task stack pointer, ‘Stack Top‘ in the Kernel Awareness view) and pxStack (the end of the stack, ‘Stack Base‘ in the Kernel Awareness view). The beginning of the task stack is not stored in the TCB as not necessary for the Kernel. The ‘Stack High Water Mark’ is something very useful: FreeRTOS fills the stack space at task creation time with a 0x5a byte pattern. The debugger or the RTOS can find out that way the ‘high water mark’ for each task. 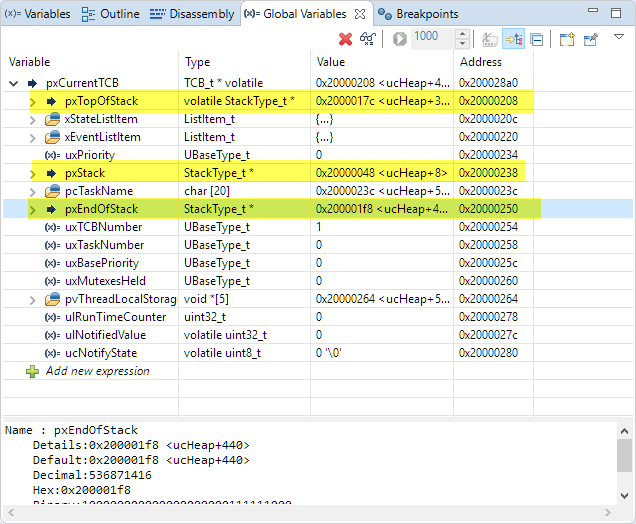 Actually it is still showing 432 Bytes and 440, because it does not count the first and last entry on the stack. Of course there is a reason for FreeRTOS not to store that pxEndOfStack by default: it is not needed by the Kernel. So enabling configRECORD_STACK_HIGH_ADDRESS will need 4 more bytes of RAM for each task plus a few code bytes to set that value. But for debugging purposes and this is very well spent. This entry was posted in ARM, Cortex, CPU's, Debugging, Eclipse, Embedded, FreeRTOS, Freescale, Kinetis, LPC, LPC, MCUXpresso IDE, NXP, Tips & Tricks and tagged ARM, FreeRTOS, Freescale, Kernel, Kernel Awareness, MCUXpresso IDE, NXP, software, technology, Tips&Tricks by Erich Styger. Bookmark the permalink. Thanks fort this article Eric. I am just wondering if FreeRTOS Kernel Awareness can be installed as a stand-alone add-on for native Eclipse (so for version without MCUExpresso base) ? 1. when xTaskCreate API is used TCB and stack is allocated using memory is allocated using pvPortMalloc which means its allocated on HEAP section of memory, what should be stack size in linkerscript? 2.which stack pointer FreeRTOS uses(on cortex-M)? I read somewhere on internet Cortex-M port of FreeRTOS uses only MSP for both OS and Application code if that is true then what will happen if task currently executing uses almost all stack and either OS API is called or interrupt comes? I read your article ARM Cortex-M, Interrupts and FreeRTOS, disregard the second question, how to determine minimal stack size in linker script for executing main which contains peripheral init and same stack will be used for Interrupts. 1. Unless you are using the FreeRTOS Heap Scheme 3 (using stdlib malloc/free), everything is managed by the FreeRTOS heap manager and you don’t have to specify anything in the linker file. 2. during startup and in main, the Cortex core uses the MSP by default. With starting the scheduler, the PSP is used for the task stacks, while the interrupts are still on the MSP. I’m not sure which version of FreeRTOS you’re using, but for v9.0.0, configRECORD_STACK_HIGH_ADDRESS is not used in any of the FreeRTOS code. For v9, configUSE_TRACE_FACILITY needs to be set.